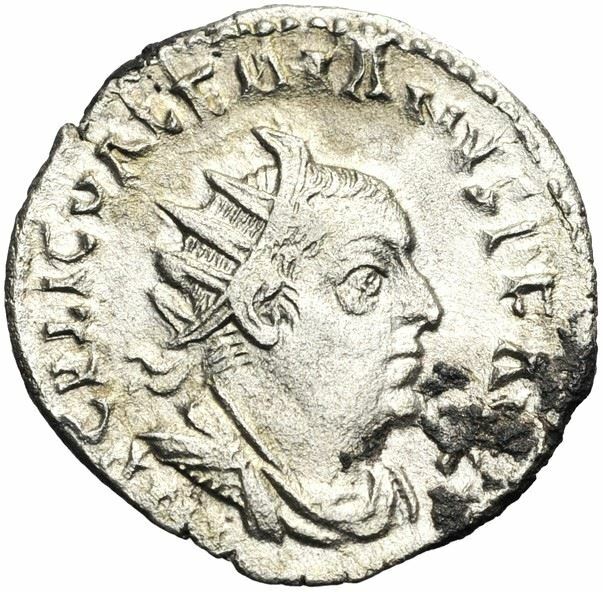 Publius Licinius Valerianus Augustus, also known as Valerian the Elder, was Roman Emperor from 253 to 260 AD. Early in his reign, affairs in Europe went from bad to worse, and the whole West fell into disorder. In the East, Antioch had fallen into the hands of a Sassanid vassal and Armenia was occupied by Shapur I. Valerian headed East to face the Persian threat. He was taken captive by Sassanian Persian king Shapur I after the Battle of Edessa, becoming the first Roman Emperor to be captured as a prisoner of war, causing shock and instability throughout the Empire. He was used as a footstool for Shapur's horse and eventually executed; He was made to swallow molten gold, then stuffed and displayed as a trophy in the main Persian temple. (5) Valerian I 254-255 A.D.
(6) Valerian I 255-256 A.D.
(7) Valerian I 255-256 A.D.
(8) Valerian I 253 A.D.